When it comes walking around with an iPhone, many friends and acquaintances prefer to go commando, but I always have a case on my iPhone. I want to protect my investment but I also want a slightly grippy case that is easy to grab out of my pocket and secure to hold. Cases are made in all kinds of materials from silicone (gummy) to aluminum (slippery), but have you ever considered wood? The folks at Woodchuck have. 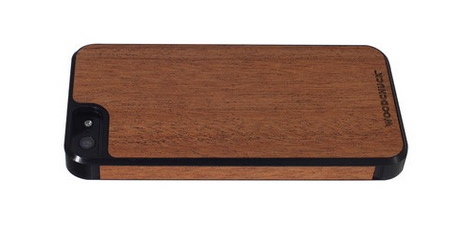 This one for the iPhone 5 is from their Adventure series using natural mahogany. 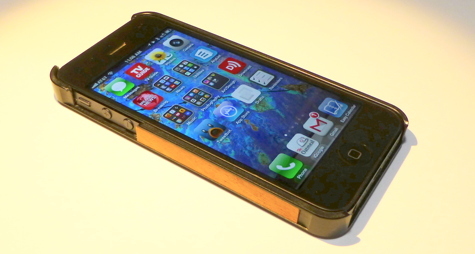 The premium Woodchuck cases are made entirely in the USA using slabs of wood incorporated into a rigid plastic body. They offer a beautiful selection ranging from rosewood and ebony to birch and walnut. They even make some intriguing parquet effects. Woodchuck also manufactures cases for several other phones as well as tablets. Wood is tactile and warm to the touch. It has a pleasing texture that feels satisfying in your hand. Wood is a natural, renewable material that makes your phone feel unique and not mass produced by anonymous machinery. For an additional $20.00, Woodchuck can laser-engrave your logo, signature, or other graphic element onto the case. I’m an officer in the Tucson Macintosh Users Group so I had our logo engraved on this case. The fine detail and workmanship make the finished product very appealing, if somewhat expensive. I can’t comment on the long-term durability of these cases. They are wood after all, but they look and feel wonderful. Depending on the condition of your hands and the relative humidity, wood can be grippy or smooth. In most cases, it doesn’t feel too slippery. The angled chamfer on all of the plastic edges has a very slight ribbed texture lending additional confidence to those of us with fumble-fingers.